The pumps are suitable for construction, civil engineering, quarry, mining and industrial locations where pumping high-volume fluid displacement is essential. 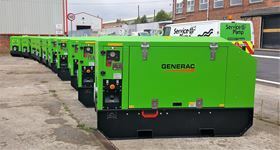 Service Pump has bought a range of 4 inch Generac DWP-4S and 6inch DWP-6S pumps from Generac Mobile Products. The DWP range of diesel-driven pumps offers silenced vacuum assisted self-priming and water-cooled pumps. The range of DWP-SP self-priming Silenced pump sets are designed with high solids handling capacity to pump water with solids up to 75mm, sand and mud particulates; and are available with variable engine speed from 1500 rpm to 1800 rpm. The DWP-4S and DWP-6S range have run dry protection systems and the fact that it is available with either turnkey start or automatic stop/start functionality to enable efficient management of water flow and fuel consumption.